Choosing a color palette is my faaaaaavorite part of a project. When it’s time to choose the appropriate colors, I need my options unadulterated and in my face. I need minimal bells and whistles, so that I can laser-focus on my color task. My tool of choice: The app formally known as Adobe Kuler, Adobe Color CC. Adobe has recently renamed this popular app, which over the years has evolved from a simple web-based tool to Adobe Color CC, a color theme generator fully integrated into Creative Cloud. 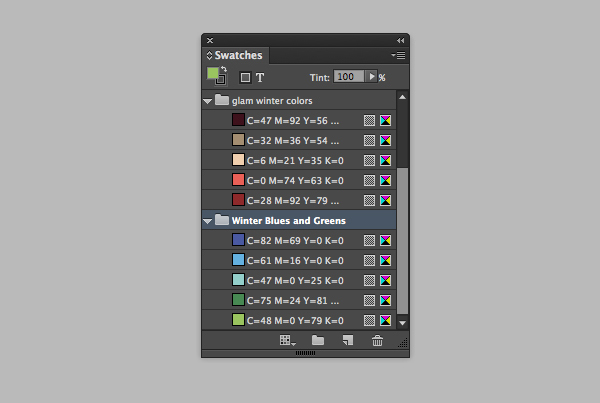 The app’s basic functionality hasn’t changed, but Color CC lets you play around with and save various color themes. Each theme is a set of five colors. 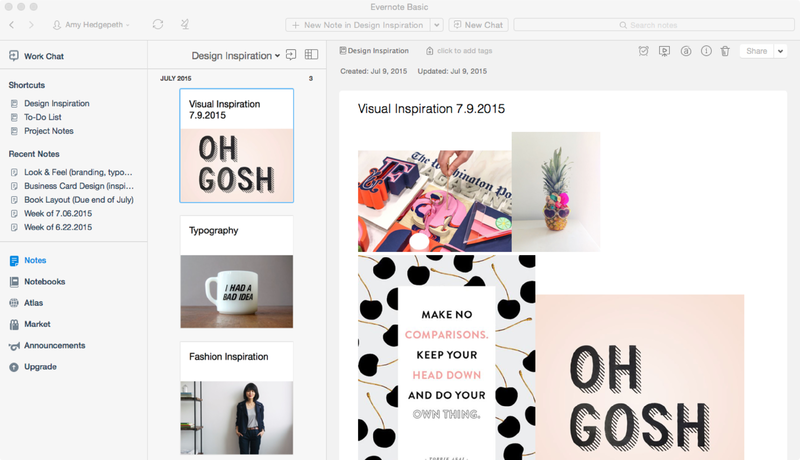 When signed into Adobe, you can sort and store these themes online in case you need to come back to them, and you can also browse through the themes of other users for inspiration. Adobe Color CC is available in various browsers and as a desktop version. Since Adobe Color is integrated into every Creative Cloud application, if you’re using the desktop version, you can export a color theme into any CC app… which is super efficient, because I never have to toggle outside of my project to create a new theme or refer back to my old ones. I love being able to export my themes as swatches to pass to whoever needs a quick color reference for a branded product. When working on large, robust websites, it’s easy to overlook what changes have been made to templates or style sheets. So how do you follow updates and make sure you don’t accidentally undo the work of someone else on your team? There are many ways something could go wrong when enough people are working on the same website. And that’s where Git and GitHub come in handy. Git is a tool that tracks the revision history of my source code. It knows what changes I’ve made to specific lines of code, and can even tell when I’ve added or removed files from a project. I can also leave comments about different tasks or specific revisions, which makes it a lot easier to figure out why I made certain changes later on. As much as I’d like to think I have a great memory, it’s easy to forget what I’ve done in the past when juggling multiple projects. GitHub is a service that hosts web projects that are being tracked via Git. The files are published to GitHub where other team members can view the revision history, leave comments, and download the source code to work on their own changes. Team members can create branches of a project if they’d like to take it in a different direction and then merge those changes back to the original project files. Version control: When you make changes to a website, you may inadvertently break something in the code. But have no fear, that’s where version control comes to the rescue! Git works as a version control system where you can rollback to previous versions of a project. If you make an update that completely breaks something else on a site, you can use Git to load the files from a previous version before the error or issue occurred. Documenting changes: Over time a website goes through many updates and edits. With so much going on, details can get lost in the mix. That’s where Git’s tool of adding comments before committing changes is incredibly helpful. After making updates or edits to the source code, you add a comment about the changes, then commit the changes to sync with the project. Later you can see when changes were made and why they were made by reviewing your previous comments. Commenting on changes: GitHub makes it easier to communicate with other team members who review your code. You can comment back and forth about specific lines of code, which helps smooth out any bumps in your development logic. After all, having a second pair of eyes review your work is a great way to catch mistakes you may have missed. I used to rely on handwritten to-do lists exclusively. I thought that because of the writing aspect of the note, I was more likely to remember the things on the list. Lies. I would totally forget things, and I would spend way more time perfecting my handwriting for said to-do list instead of actually accomplishing the things on the list! I have been using Evernote since June of 2008 when it was released. Since then, it has only improved my workflow. Evernote works across all my devices—so if I created a note on my work laptop, I can still check it out at home on my iPhone or iPad. Evernote is a program that collects all of my things—literally a collection of all of my collections. I mean, their slogan is “Remember Everything™”. I am constantly making notes, to-do lists, project descriptions, visual inspirations, websites to visit at a later date, notes for a presentation, or real time notes during conversations and feedback. Evernote does 3 really amazing things that my life in the office easier: Allows me to attach files to any note, ability to drop images or visuals into any note, and the checklist function. File Attachments: When I take notes on a project, there are usually supporting documents. That can range from old PDFs to reference, to Excel spreadsheets full of numbers and specs. I like for this all to stay in one place to reference when needed. Evernote allows me to copy and paste the project guidelines text into a note, and also attach any supporting files. That way when I go back to begin the project, I can easily access the PDF or spreadsheet I need! Image Collections: As a designer, 50% of the project usually involves researching and nailing down a visual direction. For me this can mean pulling tons of inspiring photos from blogs, websites or videos and collecting them in one space to reference during the project. With Evernote, I can add any images to a note and view it as I read the project description or list in the note. This makes inspiration for every project super convenient and organized. Checklist Function: Like I mentioned before, the handwritten to-do list has been an epic failure in my work life. But thanks to Evernote, I can create checklists right in my notes. I keep a notebook specifically full of weekly to-do lists. Every week I generate a note that includes a to-do list that shows all my projects due within the week. I can even highlight them to make sure I don’t skip over them! It’s great for me because every week it is inevitable that I’ll add a handful of urgent projects to my to-do list. My Evernote list is ever-changing, and easy for me to update on the fly. I can be at lunch, pull out my phone and add an urgent project while I pay for my overpriced salad! 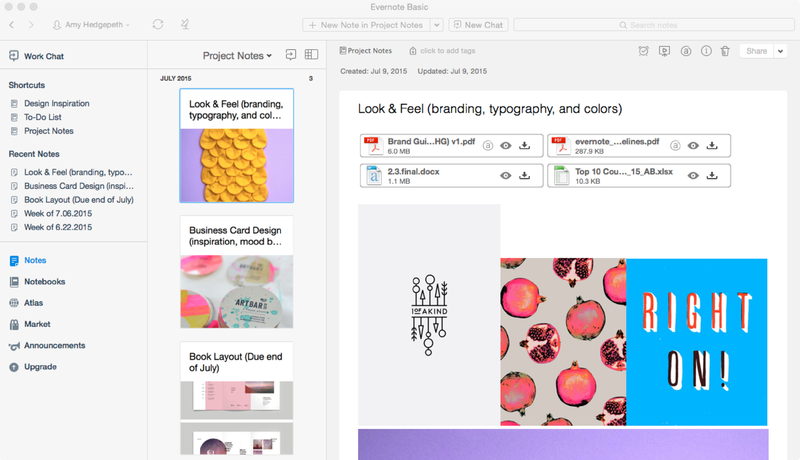 Without Evernote, I would not have an efficient way to track my projects, add visual inspiration and keep my project files in one place! And this way, I can access it anywhere, anytime. 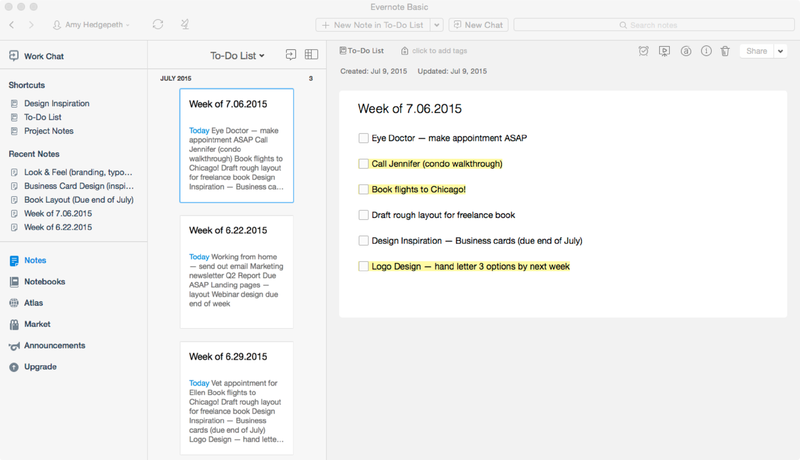 Evernote has enhanced my productivity in the office—you should check it out! Do you have ways you enhance productivity in your home life or work life? We’re familiar with brainstorming as being a collaborative group discussion where the participants all contribute ideas that will ultimately create a solution to a problem. This is indeed true… but what constitutes a great brainstorming session? What is the formula for making amazing ideas? Where do you start? No brainstorming session is complete without a good team. Grab a couple people from each area involved in project production: creative team, project managers, content strategists, client/task manager, marketing associate, etc. You want a diverse group that can contribute different perspectives on the project. Definitely have a moderator, someone to keep everyone on track when the idea wheels start churning. …a time limit. 1-2 hours. Enough time to get some steady creative juices flowing and not too much where you run the risk of burning out or overthinking. You can always have follow-up sessions. Prep the team before the meeting, so that everyone arrives on the same page when the session starts. Be visual! Draw mind maps, make priority clusters with post-its, make outlines… Get those ideas out there! Onward and upward: Move forward with the best ideas. These bits of genius are whittled into shape and an implementation plan is created. Brainstorming isn’t just about solving problems. It’s about empowering the team by letting everyone contribute. It’s about creating strong team bonds through effective and efficient collaboration. It’s a nasty habit we’re all trying to break. The paper habit, that is. We’re all looking to trim our consumption, both at home, and on the job. But in the marketing and communications world, sometimes it’s not that easy. We build websites and e-books, but sometimes the takeaway that makes the biggest impression is the one that comes printed on paper. USGBC has worked diligently to curb its use of paper, moving to digital distribution (like our web-based reference guide), our email subscriptions and e-books. But when we do need to go the paper route, we follow some simple guidelines for making smarter decisions. Not only do these tweaks save trees, they also save money. We always select paper that’s 100% recycled, 100% post-consumer, and FSC-certified. Some paper products we’ve used for our favorite collateral pieces includes Enviro100 (Rolland), Mohawk Options (Mohawk), New Leaf Imagination 100, New Leaf Everest (New Leaf Paper), Environment PC 100 (Neenah Paper), Evergreen 100 PC (Fox River Paper Company), and Monadnock Astrolite PC 100 (Monadnock). When project require heavier paper stock, we look for the highest available percentage of recycled post-consumer waste paper. Don’t forget about the ink! Our standard ink must be at least 90% vegetable oil based with only trace amounts of metal content (2% or lower). When it comes to sourcing a print vendor, we go for those who are certified! We look for printers with FSC chain-of-custody certification, or SFI (Sustainable Forestry Initiative) certification. Vendors that operate off of the grid, like on wind power, and those that participate in a carbon offset program are always a top pick. How is your organization being smart about paper usage? Let us know in the comments.